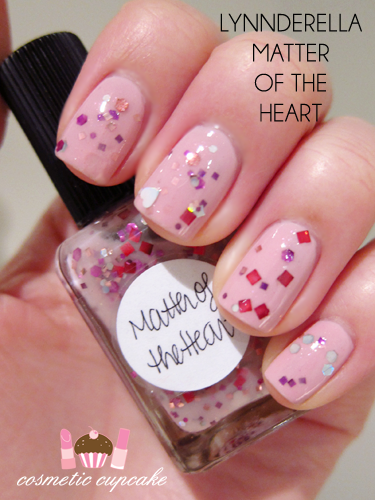 Matter of the Heart is made up of different sized silver, purple and pink hex, square and heart glitters all in a pink base. Whew! I layered it over 3 coats of pretty rose plum Essie Neo Whimsical and it's every bit as pretty as I thought it would be! 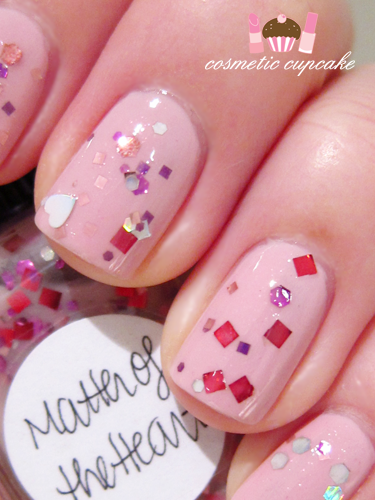 It would make a great Valentines Day mani or mani for any day actually lol. Application was a bit of a pain though. Because the glitters are mostly on the larger size, I had to get the glitters off the brush and push them around on the nail using a cuticle stick. I also had to apply about 3 coats of top coat as they don't dry smoothly so my mani was pretty thick by the end. It was well worth the trouble though!! The Lynnderella's I bought! This is only about half my order as the rest are on back order. Not all are for me though!! Ordering details: Some of you have asked how to order them. Currently they are only available through private order so you need to email lalas.lynn.network@gmail.com and go on the waitlist. Do you love glitter as much as I do? Thanks for looking as always! Aussie ladies don't forget to enter my Hello Kitty Cosmetics giveaway here! OMG it's gorgeous. I am so green with envy at that line of lovely Lynnderella's....lucky you! I couldn't agree more Jennifer! They are just stunners. Unfortunately I can't swatch all the ones I bought because I'm giving some to friends but I'll swatch all the ones I'll be keeping don't worry! Lol thanks Catherine! I'm kicking myself for not buying every single one of them (my wallet is thanking me though haha) as they are just beautiful. Wow! I love it, are very sweet and nice!! Cute mani, dear. Glad to hear you like it Marie! This is one gorgeous nail polish! I love it! And application being a pain is definitely worth it, as it looks so pretty! 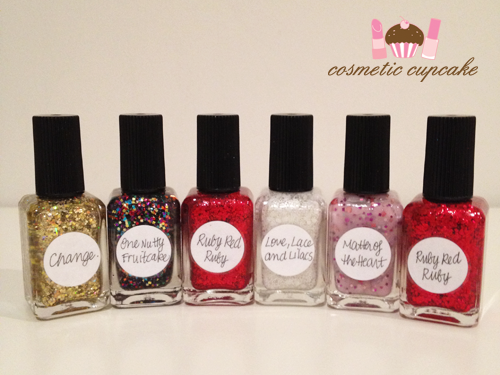 Can't wait for some swatches of the other Lynnderella polishes you got. They look oh, so pretty! Glad you like it Aleksandra! I've just updated my post with ordering details! Thanks lovely!! Neo Whimsical is GORGEOUS on it's own. You need to get it! So pretty! This is one of the only Lynderella's I'm interested in, but probably won't ever go through the hassle of getting! haha! It is a real hassle to get them but I had to get my hands on some! I sent you a tweet with 2 suggestions ^__^ Nicole by OPI Step 2 the Beat of My Heart and Love Your Life are 2 that I have! Hi Chelle! Your Lynnderella swatches have been great! I was wondering how much each bottle was? I'm guessing $15.00 a bottle? it's pretty! I just received this polish yesterday! can't wait to try it! I love your swatches, they are really neat!